United States vetoes Security Council resolution proposed by Kuwait and calling for the "protection" of Palestinian Arabs. The United States on Friday vetoed a UN Security Council resolution proposed by Kuwait and calling for the "protection" of Palestinian Arabs in Gaza, Judea and Samaria. China, France and Russia were among the 10 countries that voted in favor of the draft. Four countries abstained. At the same time, the Security Council rejected a U.S.-drafted measure condemning the Hamas terrorist group for the recent violence in Gaza. 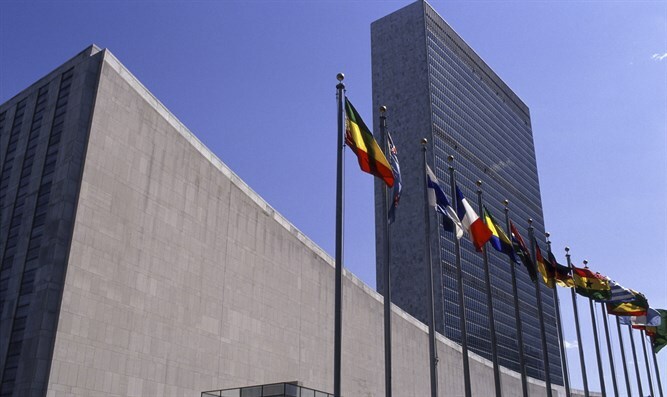 The United States was the only country that voted in favor of the draft resolution in the Security Council. Eleven countries abstained while Bolivia, Kuwait and Russia opposed it. “The Security Council had the opportunity to adopt the resolution proposed by the United States that rightly named Hamas and sought to hold the terrorists accountable for their actions. Peace and stability will come to our region only when the international community is brave enough to call out the terrorists by name. By proposing this resolution, the U.S. made clear that the rules of the game are changing in the Security Council and that the double standard against Israel will not stand,” added Danon. The Security Council had been scheduled to vote on the Kuwaiti resolution on Thursday, but the vote was postponed to Friday after the United States sought changes to the language of the resolution. The U.S. veto is in line with comments made by Haley on Thursday night, when she made clear that the United States will “unquestionably” veto the draft resolution. “The United States will unquestionably veto Kuwait’s draft resolution. It is a grossly one-sided approach that is morally bankrupt and would only serve to undermine ongoing efforts toward peace between the Israelis and Palestinians,” wrote Haley in a statement. “There is not one single mention of Hamas in the resolution, when Hamas is chiefly responsible for the recent violence in Gaza. The text criticizes ‘excessive’ and ‘indiscriminate’ use of force by Israeli forces against Palestinian civilians in Gaza, when in fact, it is Hamas that fired 70 rockets indiscriminately into Israeli towns this week,” she continued. The Kuwaiti resolution “calls on Israel to immediately cease its actions in self-defense, but makes no mention of Hamas’ aggressive actions against Israeli security forces and civilians. The resolution calls for immediate steps toward ending Israeli restrictions on access into Gaza, while making no mention of Egypt’s restrictions and no mention of Hamas’ deliberate attacks against Israel’s determined efforts to provide humanitarian access into Gaza at the Kerem Shalom crossing,” Haley wrote. Ahead of Friday’s vote, Danon called on the Council members not to support the resolution. “A biased resolution that condemns Israel yet fails to mention the terrorists of Hamas who are responsible for the violence against Israelis and Palestinians is not worthy of consideration by the Security Council,” Ambassador Danon said. “I urge all members of the Council not to support this hypocritical resolution that denies Israel the basic right of defending its citizens, and instead to stand with the United States against the Hamas terrorists,” he concluded. Friday marks the second time since President Donald Trump took office that the U.S. has vetoed an anti-Israel resolution at the Security Council. In December, the U.S. vetoed a UN resolution that would have required President Donald Trump to rescind his declaration of Jerusalem as Israel’s capital.